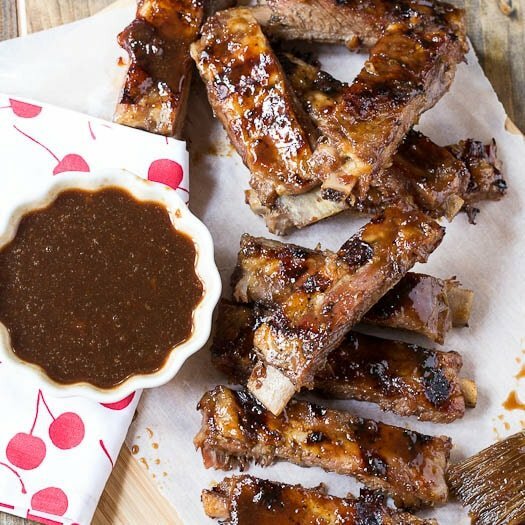 Delicious spareribs baked in the oven until tender and finished on the grill with a sweet and spicy cherry cola glaze. Grilled Spareribs with Cherry Cola Glaze are the perfect way to celebrate the last holiday of summer. 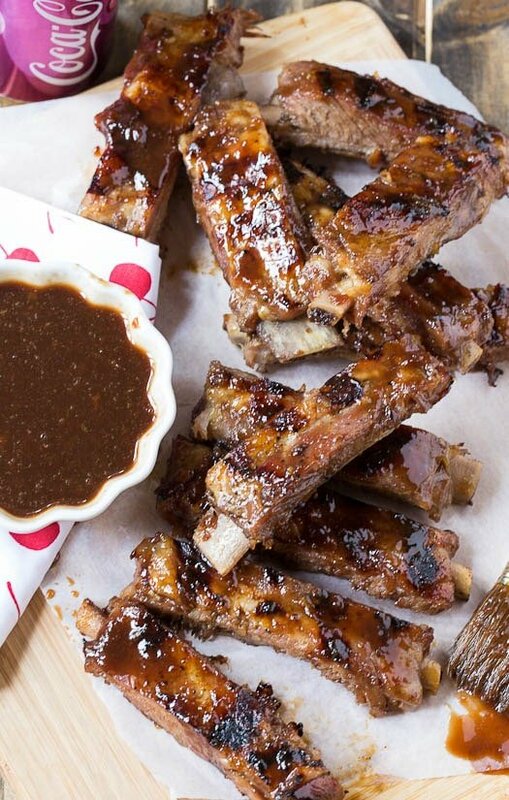 The cherry cola glaze is what really makes these ribs spectacular. It’s a little bit of a pain to make but so worth it. First you have to reduce the cherry cola down for a good 45 minutes. Once you add the other ingredients, it has to simmer another 30 minutes or so. This is a recipe that I’ve slightly adapted from Epicurious (published in Bon Appetit) and I tried it because it has many very high ratings. Interestingly, a bunch of the reviewers complained about an off-putting smell emanating from the glaze as it cooked. But they all said putting up with the smell was worth it because the glaze tastes magical on the ribs. Well I didn’t notice much of a bad smell. Maybe because I was prepared for it and expecting something truly fowl. I did agree that the sauce tastes magnificent on the spareribs. The glaze is a wonderful combination of cherry cola (I’m sure regular cola would work fine), cherry preserves, Dijon mustard, horseradish, soy sauce, apple cider vinegar, and hot sauce. The recipe calls for pouring the soda into a bowl and letting it lose its effervescence for about 4 hours, aka become flat. But I only let mine sit out for 15 or 20 minutes. I don’t think it matters much, but this recipe would be a great way to use up flat soda that is undrinkable. After baking in the oven for 2 hours, the ribs are cut into individual ribs and tossed with glaze. This was a little bit of a pain to do, especially glazing and turning individual ribs on the grill, but it made serving them and eating them much easier so it was a trade-off. The sauce can be made a few days in advance and I even baked the ribs a day in advance and grilled them right before serving. Any way you do it, these sticky spareribs brushed generously with spicy, sweet cherry cola glaze are a wonderful way to end the summer grilling season. 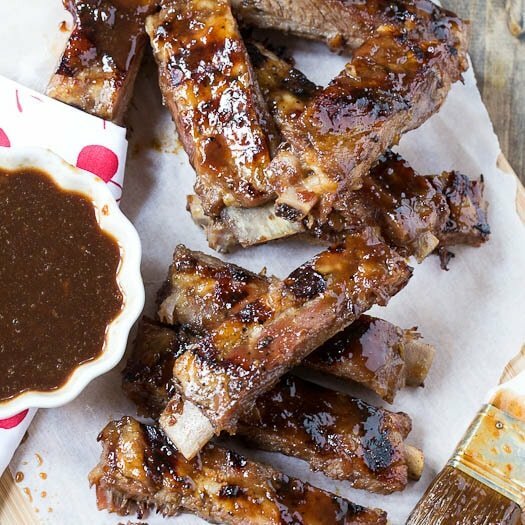 Spareribs baked in the oven until tender and then finished on the grill with a sweet and spicy cherry cola glaze. Place cola in a Dutch oven or large saucepan and boil over medium-high heat until reduced to 1 1/2 cups, about 45 minutes. Add next 6 ingredients and stir well. Reduce heat to medium and simmer until reduced to 2 1/2 cups, stirring occasionally. This will take about 35 minutes. Remove from heat. Place oven racks in top and bottom thirds of oven and heat oven to 325 degrees. Season ribs with salt and pepper. Wrap each rack tightly in foil. Divide ribs between 2 baking sheets and place in oven for 2 hours. Let ribs cool slightly. Cut racks of ribs into individual ribs. Toss with 1 cup of glaze. Grill ribs, basting with extra glaze, for about 2 to 3 minutes per side. If possible, use flat soda or pour it into a bowl and let it sit on the counter for 4 hours. But it is ok to skip this step. These ribs go great with Corn on the Cob! This entry was posted in General and tagged grilled, Pork, ribs, soda. Bookmark the permalink. can you you the same ingreidents and cook the ribs in a slow cooker? I made these for company for Labor Day. They are absolutely delicious! So tender. The sauce makes them! I couldn’t find cherry coke (only diet cherry zero & I don’t cook with aspartame) , so I used Dr. Pepper, & it was great. Our guests said they were “the best homemade ribs” they ever had! Thanks for the recipe! That makes me so happy Betty! Dr. Pepper was a great substitute. It really is a wonderful sauce. I’ve been meaning to try it in the crock pot with some pulled pork. Have a lovely week! Girl I can’t even deal after you posted these. They are so amazing! Man, if I could grill at my new place (restrictions with apartment complexes) I would be making this tonight! Cherry cola in a glaze? Sounds and looks to die for, Christin! 😀 Hope you enjoy your long weekend! It’s been too long since I’ve had ribs! Definitely will be making this glaze the next time. Perfect for the last day of summer! These ribs look PERFECT for Labor Day weekend! Love how sticky and messy they look. Cherry preserves and cola sounds like an awesome glaze! 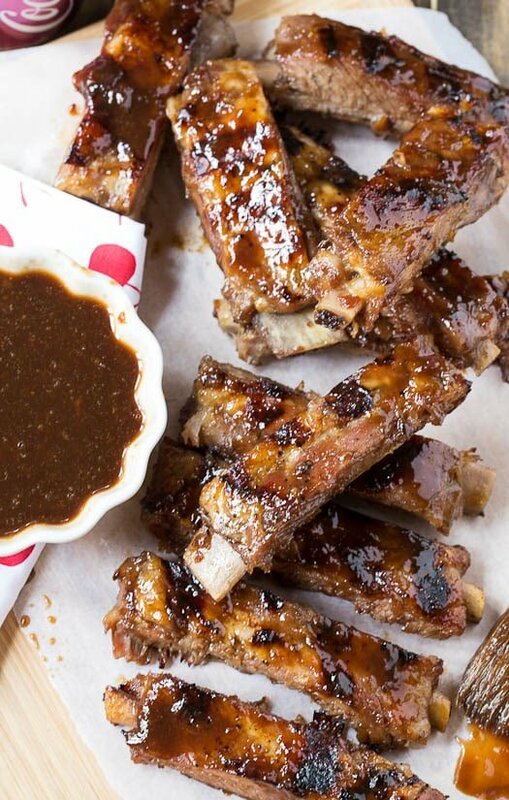 I love spareribs and this recipe sounds delicious! Pinned! I have some ribs in the freezer, I am so making that glaze. Cherry cola, WOW!! They look spectacular. My husband loves ribs and cherry cola, he would totally die over this recipe! I can’t lie, I’m totally craving some of these ribs right now. Pinning this one! Finger lickin’ good! That’s what these look like! Yummy and so so so flavourful! Pinned!